Hello... Hello ... my old friends ... It's great to see you once again! Our friends over at Spin CD's are now taking pre-orders for "Roy Wood: Original Album Series", a five  CD set for release on Monday 24th November. This attractive issue includes "Message From The Country" [The Move], the first Electric Light Orchestra [ELO] album, "Wizzard Brew" [Wizzard] plus Roy's acclaimed solo album "Boulders" as well as "On The Road Again". Yours Truly KJS understands that this will be a slim boxed set with each album presented in a cardboard replica album sleeve. The set is priced at £11.99 and can be pre-ordered via Spin CD's here. The item will also be offered by amazon.co.uk [and other reputable music vendors] shortly. 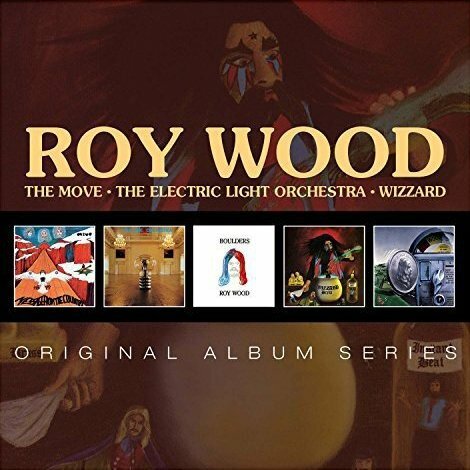 ELO Beatles Forever [ELOBF] recommends "Roy Wood: Original Album Series" by Roy Wood to those enlightened folks who enjoy the music of ELO, Jeff Lynne, The Move, The Idle Race, 'Brum Beat', The Beatles and related artistes. With many thanx to Julian Crook. Will the Move's MFTC contain the bonus tracks that were included in the 2005 reissue?